I spend a lot of time looking at cookbooks to find good ones. This one made me smack my head and wonder why I hadn't thought of it. "The Homemade Pantry" by Alana Chernila is filled with ideas for making the processed food that you buy yourself. Take that PopTarts! I am not going to buy you anymore! Actually, I don't buy PopTarts if I can help it, but I did make my own just to see how they would come out. Yeah, that would be yummy. There are recipes for ketchup, tortillas, chicken nuggets, and salad dressing (and lots of other stuff). Alana has chosen a bunch of things that we can make fairly easily and the photos in her book are enticing. Okay, I don't know how many of you will find the time to make your own ketchup - but you should find the time to make your own instant oatmeal. This is simple, delicious, and will save you a ton of money if you buy those little packets. Also, you can regulate how much sugar is in your mix, which is why I haven't found an instant oatmeal to feature on Snack Girl. Too much sugar! The instant oatmeal recipe was featured in her book for her children to make when it is the weekend and Alana stays in bed until 8 AM. Ummmm, I think she may have to right another book about how she manages to get her kids to let her sleep (or do anything for that matter). For those of you trying to stop buying processed food at the grocery store, this is a great book to get you started. Preheat the oven to 325°F. Spread the oats on a baking sheet and bake for 20 minutes. Cool slightly. In the bowl of a food processor, combine 4 cups of the toasted oats, the brown sugar, cinnamon, and salt. Pulse until the mixture is a rough powder. Pour into a large wide-mouthed jar or container. 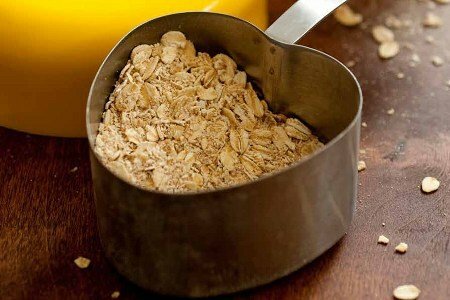 Pour in the remaining 2 cups of oats and the fruit, if using. Stir thoroughly and top with the lid. To make the oatmeal, combine 1/2 cup of the mixture with 1 to 1 1/2 cups boiling water. Cover with a plate and let sit for 5 minutes before stirring and serving. Combine 1 cup granulated sugar with 2 teaspoons unsulphured molasses. Fluff with a fork or beat in a stand mixer until the molasses is entirely incorporated in the sugar. There will be a tense moment—the molasses will clump—but carry on! Mix a bit more and you will have brown sugar. For darker brown sugar, increase your molasses. Store in a covered container for up to 6 months. Love the recipe for the brown sugar. Now when I am baking and run out I can make my own. As for oatmeal I don't add any sugar but will make this without and add chia seeds and walnuts last. Love oatmeal!! This would make for a great gift for those oatmeal fans in your life!! Thanks, Lisa! I've always hated instant oatmeal! This sounds so much better! I love old-fashioned oatmeal, & this sounds like it would be so easy, once you had it toasted & out of the food processor! I just put 1/2 cup old fashioned oats in a bowl, pour enough water to just a bit more than covered, add cinnamon, microwave 45 seconds, stir, microwave 45 seconds, done. If I want it thicker I microwave 15 seconds more. Super fast and easy in the morning. Packaged oatmeal is horrible - there is so much sodium that my teeth feel funny for half the day after eating it. Stupid question: why are we adding sugar to oatmeal? When did breakfast become about cookies and cakes? stir, stick in fridge overnight, heat up (microwave, stovetop, whatever) the next morning. I usually dice up apples and bananas as a topping. Sweet fruits? Yes. Refined sugar? No thanks. I don't get it. I make oatmeal everyday in minutes and do not go through all this prep. Rolled Oats and almond milk in the microwave for 2.5 minutes then throw in some fresh or dried fruit. Oatmeal in minutes. Am I missing something? As the author states, this instant oatmeal is also for kids who like some sweetness and need something very simple. I buy Bob's organic quick oats and add water to cook then add p.b. and jelly and it's made in under 5 min.! I'm interested in checking out her book for some new ideas. I'm always interested in eliminating another form of processed food in my house. I make my own instant oatmeal - instant in that the ingredients are ready to throw in a bowl to cook. I measure out single servings of oats, a little bit of brown sugar and a little bit of splenda into a small container. In the morning I throw it into a bowl, add water and microwave. I do this with both large flake oat variety and steel cut oats. I just need to get the steel cut oats into the microwave earlier! I'd rather cook the oatmeal in the microwave longer than bake and put oatmeal in a food processor ahead of time but that is just me. Love this idea! I will definitely be trying a batch of homemade instant oatmeal over Christmas. I am going to try this with my porridge oats! I love to make them but that typically requires a pan on the stove... I buy sliced almonds at trader joe's to add on top. Thank you! I bought old fashioned oats because it's the season for baking, and so I haven't bought any quick oats because I don't want two giant canisters in my overpacked kitchen. I will definitely be doing this because sometimes scrambled eggs for breakfast gets so boring! I'm having this for breakfast today :-). I made it last night and brought it to work. (Of course, I had to try some last night -- it smelled so good! -- it was delicious!). My answer to those who ask why bother doing this when you can put regular rolled oats in the microwave: I don't own a microwave! I don't plan to own one, and I'm happier without it. Also, many offices have a water bubbler that dispenses hot water, but they may not have a microwave. I plan to make a big batch of this to give to my dad for Christmas. Thanks, Snack Girl! would steel cut oatmeal work as well in this recipie? I use old-fashioned oats, and cook it in the microwave. I use 1/3 c. oats, 2/3 c. water, and cook on high for 90 seconds. (You can do 1/2 c. oats & 1 c. water, and cook it a little longer.) I usually chop up a few dates and throw them in, and sprinkle some cinnamon on top, then sweeten the oatmeal, and add milk (hubby doesn't) when it's done.